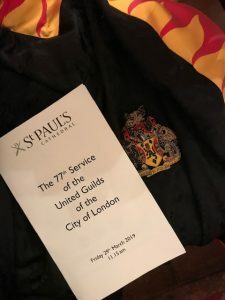 In a colourful display of Company gowns and finery, Livery Companies and other members of the City came together at St Pauls Cathedral for The 77th Service of the United Guilds of the City of London. We were joined by The Right Honourable The Lord Mayor and his dignitaries including The Sheriffs and Ward Beadles, each Beadle dressed in their robes, tri-corn hat and carrying the ward mace. The Bishop of London and assembled clergy also looked bright and colourful as they processed, gold threads glinting in the sun which streamed down from the windows above. As the fanfare filled the Cathedral, it was really quite a special moment. 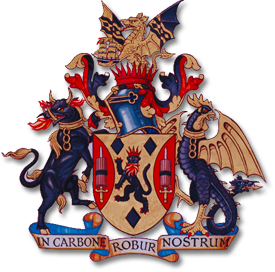 Being 110 Livery Companies in total, there are too many to process at once and so only the Masters of 12 other Companies are invited in turn each year to follow the ‘Big Twelve’ with the remainder already seated. This year was the turn of our Company with Shravan processing down the aisle. Resplendent along with Junior and Senior Wardens in our bright ‘flaming’ gowns, we drew many an admiring compliment! We were also joined by several other Past Masters and Company members and all sang in strong voice! After the service we all spilled out like a rainbow onto the main steps of St.Paul’s with many a passing tourist pausing at the sight. Then onto lunch as guests of The Worshipful Company of Pewterers. After a delightful lunch, Master Pewterer gave us some fascinating insight as to their origins, their Royal Charters, some of their Treasures and the piece which drew the biggest gasp, a flag which has survived from 1662, not destroyed during the Great Fire of London as it was flying on a barge on the river at the time. That barge was conveying Catherine of Braganza, the future wife of Charles II. After enjoying such wonderful hospitality, all too soon it was time to leave. 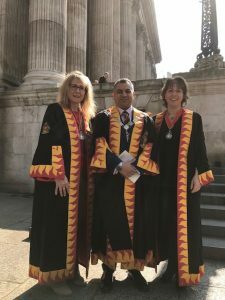 A very interesting day in the City, leaving one very proud to be a Liveryman.